Wild Idaho Rising Tide (WIRT) and allied, #No2ndBridge activists, friends, and supporters invite and heartily welcome your input and involvement during an upcoming weekend of opportunities to discuss, train for, and stage resistance to the fossil fuel and railroad industry degraders of basic, global, human, environmental, and climate health and rights. Interior Northwest residents are organizing and co-hosting fourth annual, Panhandle Paddle activities, to stand against Burlington Northern Santa Fe Railway’s (BNSF) proposed bridge and track construction across Lake Pend Oreille, Sand Creek, and Sandpoint, and regional trains hauling volatile, Alberta tar sands, fracked, Bakken crude oil, dusty, Powder River Basin coal, and other hazardous materials that recklessly endanger our lives, communities, lands, water, air, and climate. This fossil fuel infrastructure use, expansion, and deterioration has resulted in multiple, recent, train derailments and collisions in north Idaho, northwest Montana, and beyond, including disastrous, coal and oil train wrecks, spills, fires, and pollution of the Clark Fork River near Heron, Montana, and the Columbia River Gorge in Mosier, Oregon. 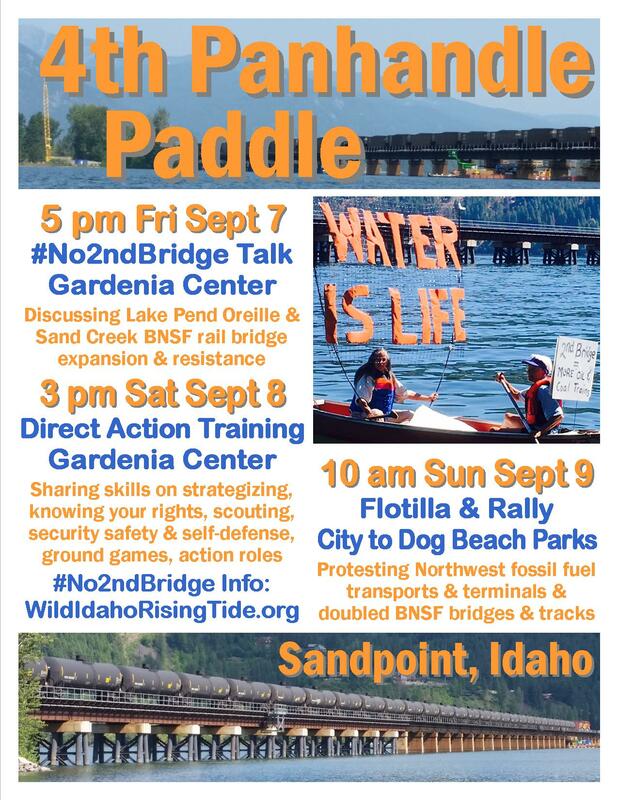 Please join us at these annual, Panhandle Paddle events at the Gardenia Center, City Beach Park, and Dog Beach Park in Sandpoint, Idaho, on September 7 to 9! At this informal, #No2ndBridge presentation and discussion, local activists will share issue information, expand knowledge, and brainstorm ongoing tactics and strategies for creatively engaging and mobilizing further community resistance and regulatory and legal recourse to BNSF’s proposed, Sandpoint Junction Connector, track and bridge expansion project and the current, dirty energy pipeline-on-wheels over Lake Pend Oreille, which activists have denounced during each of the Panhandle Paddles. 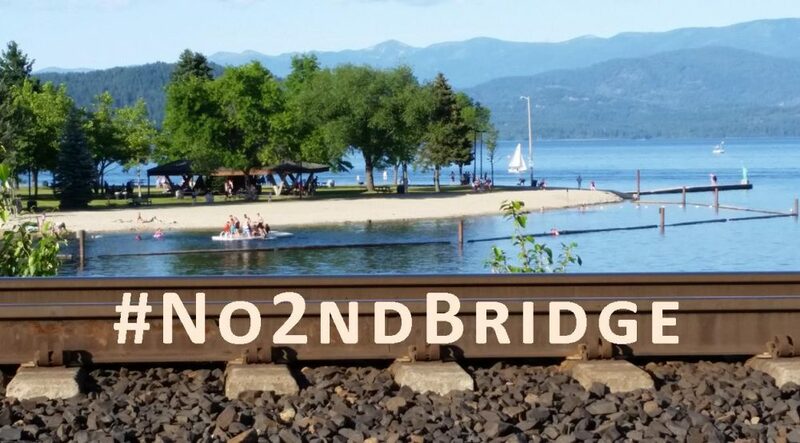 Please bring snacks and your concerns and ideas about campaign organizing and railroad monitoring, and gather with regional, event participants at 5 pm on Friday evening, September 7, at the Gardenia Center, 400 Church Street in Sandpoint, Idaho. After the meeting, we plan to broaden camaraderie and coalitions among fellow activists, while continuing conversations and enjoying music at downtown pubs on Friday evening. Water protecting, climate activists converging from across the region will offer several, crucial, interactive, training workshops, through talks and videos sharing frontline skills, stories, and insights, chosen by and adapted to rural participants and applicable to various, ecological and social resistance movements. Advocating grassroots, direct actions at the sites of environmental destruction and through ineffective, government processes and the expensive, legal system, trainers will provide sessions on topics such as knowing your rights, strategizing, scouting, community security, action roles, ground games, safety and self-defense, countering police tactics, and jail solidarity. Organizers giving these trainings hope to connect with, learn about, and nurture the inspiring momentum building in the Idaho Panhandle. So they encourage people who plan to attend to RSVP in advance, to request coverage of particular topics and further logistical information, and to contribute potluck food and legal defense funds. Join WIRT and guests between 3 and 5 pm on Saturday, September 8, at the Gardenia Center, 400 Church Street in Sandpoint, Idaho. For a fourth year, WIRT and allied activists are bringing their boats, bodies, and bravery to two locations, for on- and off-shore protests of Northwest coal, oil, and tar sands transports and terminals and BNSF, rail bridge and track expansion in north Idaho. To accommodate the schedules of participants who are renting single or double kayaks, paddleboards, or other manual watercraft from downtown Sandpoint businesses that open at 10 am, activists are meeting at the same time on Sunday, September 9, near the south boat launch at City Beach Park in Sandpoint, Idaho, for music, speakers, and a kayaktivist flotilla around the current rail bridge, departing after people arrive by land and water. At 12:00 noon on Sunday, another rally will greet Panhandle Paddlers at Dog Beach Park south of Sandpoint. Bring large, attractive banners and signs, visible to observers at great distances from both gatherings, and respond to WIRT with your boat rental intentions and mobility needs, so we can reserve and cover the costs of watercraft, and arrange bike trailer transportation for folks who cannot walk to Dog Beach Park. Can you donate toward watercraft rental fees or offer boats, gear, or supplies for this event? Would you drive enthusiastic, Panhandle Paddle participants to Sandpoint, or help with their travel expenses? Can your group or organization endorse and/or co-sponsor this demonstration of people power? Will you contribute your inspiring words and/or melodies or sustaining snacks and beverages? Please visit the WIRT facebook and website pages, and contact WIRT via phone, text, email, facebook, or website, with your questions and suggestions, and for further background and event information, and to offer assistance, materials, and donations. To bolster this community event and support our lawsuit against the state permit for BNSF rail bridge encroachments, please pitch in toward collective expenses by mail or at Donate to WIRT. Print and post the enclosed, color, letter-sized, PDF version of the Fourth Panhandle Paddle Flyer. We eagerly anticipate sharing these experiences with you and your friends, family, neighbors, and co-workers, on September 7 to 9 in Sandpoint, grateful that regional community members are actively opposing dirty energy extraction and transportation. Thanks!